The word “partition” is one that most Indians have grown up with as a part of their consciousness. It’s not that we know of “people” who had seen it – it’s that those people were our parents, grandparents, or our best friends. We know of people who had to leave everything behind to come and start a new life in a new place. We know of the struggle and hardship that took place. We know of changing hierarchies and loyalties. Badal is one such character who has seen as well as experienced the hardship that one goes through during Partition. Goutam Ghose is immensely influenced by the political and cultural milieu of post independent India. Having the opportunity of visiting alien lands, he comments on the present scenario, the world is passing through, in his films. Shankhachil reflects the theme of borders and boundaries. The ablest hand of Gautam Ghose treated the idea of constant crossing, recrossing or with the rejection of borders and boundaries. Shankhachil discusses both the political impact and the methodological dimension of borders and boundaries by exposing the systematic correlations. Borders drawn out of some political interest affects the harmonious environments. This kind of division brings out nothing but wars, massacres, riots and unhappiness among the people. This division can only be blurred through the amalgamation of industry, cinema and culture. Shankhachil has been able to eliminate the difference between the the two cultures to a great extent. The film has been appreciated by audiences from both sides of Padma/Ganga. Winning the National Award just before the release of the film has helped in reaching out to more people. It is a great honour for the entire team of Shankhachil. People always expects this kind of honour for a Goutam Ghose film and Shankhachil too has lived up to it’s expectation. I’ve been flooded with phone calls and messages on social media. The response is really overwhelming. Goutam Ghose has incarnated in himself the stature of a great film maker among the world’s famous directors through his sharp eye and sense of perceiving the human being and their societies in the right earnest. It would be an honour to represent the Bengali film industry in other parts of the world. Looking forward to more such joint ventures in the future which will enhance the film industry in both the countries. I thank the jury of the 63rd National Film Awards for bestowing upon us this honour. The celebration of colours in Nature, the celebration of a new beginning, the celebration of vibrancy…Holi is a festival much more than riots of colours and smearing colour on your near and dear ones. In our country, where there are 33 crore Gods 7 Goddesses coexist; Holi is a meaningful amalgamation of tradition and devotion. Colours are the reflections of human emotions. 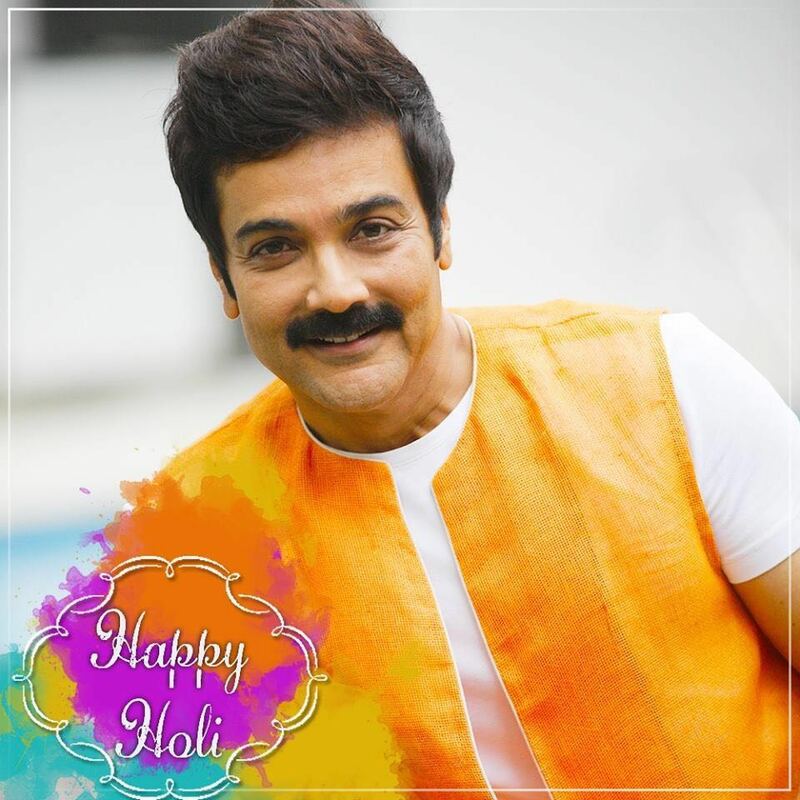 Each and every colour symbolizes something…be it love, togetherness, peace, sacrifice, anger and many more! I remember in my childhood days I used to stay away from colours. The loud music, forceful scrubbing of bright abir on face, and the pink face of mine in the mirror…I did not like at all! But Maa made me understood that Holi is not only about playing with colours but it also adds value to our life. When I started to know the cultural significance of this great festival, I participated with others. Holi has never been very loud to me. The day would start by taking blessings from the elders with abir. It was very rare that I would go out and play with others. With the growing age, playing safely with colours seemed to be fun. While residing at Dumdum, I used to go out with very few friends to play Holi. The evening before Holi, we used to lit the bonfire symbolic to the destruction of the demoness Holika by Vishnu. The myths and stories attract me more than anything else in a festival! I never get bored listening to them! But after playing, we, the monkey faced youngsters used to scare people in many innovative ways! How beautiful those days were! Now, Holi has become just another festival for me. I stay at home this day. Mishuk stays at hostel mostly during holi. So, I hardly get a chance to celebrate with him. But this year he is here. So this year Holi is special for us! I don’t mind how he wants to celebrate the festival, but I make sure he must learn the tradition of taking blessing from elders at the beginning of this particular day. This is all what we could pass on to our next generations…the importance of traditions, the understanding of significance of festivals. Make the most of this colourful festival! Happy Holi once again! Love to all & stay blessed! Yes, yes I’m talking about Luchi & Sandesh! I haven’t met a single Bengali who doesn’t like these signature Bengali dishes. And yes, being a Bengali, I’m a proud food lover! From Shukto to Bhapa Ilish to Khichudi to Malpua…I love them all! But why am I suddenly talking about food? Well, I’m often told I don’t look like my age. Who doesn’t like compliments like that! But honestly, I pay high price for it! How I let those delicious temptations pass by I only know. Now fitness comes first for me than the luxuries of tongue. And this has become a life style. I take food as medicine. What I eat, it’s difficult to swallow for others. I eat to live but there was a time when I used to live to eat! Haha! I love to experiment with looks in my films. To become Kushal Hazra in Jaatishwar I lost kilos in a very limited span of time. For Shankhachil too, I shaded weight. Badal is a simple village teacher who is going through some tremendous crisis, so I needed to look sickly. The best part was, while shooting in Saatkhira, I overheard people saying, probably I got sugar that’s why I looked so pale! I felt, yeah, I achieved the look! I survived only on curd and cucumbers too to get that look. Now my all time favourite Luchi & Mutton Kosha replaced by green veggies, juice and fruits. But there must be times when I’ll let lose my rules. Sunday is my ‘Sin-day’ actually! No restrictions, no rules are applicable on Sundays! And during Durga Puja too, I make it a point not to miss the ‘Mohabhog’. The divinely delicious khichudi, pulao, alurdom I can’t resist! They taste so different, so good! But most of the time, I enjoy watching others eat. I arrange small get together at my home and arrange good food. I love it when people enjoy their food. I love to see others eating with utter love and satisfaction. Someone said it right! No matter how you slice or dice it, the gateway of one’s heart is through good food. May be you are cooking it, feeding it or eating it! Cheers to food! Work hard and party harder, they say! In the midst of my busy hectic schedule, finally took out some time to refresh and rejuvenate myself! Last night, we, the whole team of Purulia Panthers reunited followed by the grand birthday bash of the captain of Purulia Panthers, Jisshu Sengupta. And it was a nice, cozy, homely party that we enjoyed and had some great time interacting, laughing and eating together! It’s been 2months since we parted! I mean, the whole team of Purulia Panthers! During practice sessions, matches we bonded so well that even after winning the final match all were a bit upset that they would not be able to meet each other every day. As T20 World Cup is going on, cricket became automatically the topic of discussion. It was nice to see them taking the game seriously and really trying to learn it by heart. And then the ‘Shankhachil’ team joined in. The topics of the adda diversified… films to music to cricket to politics everything under the sky were talked about. The supporters of Purulia Panthers also joined in. Ankush dropped in late at night. Nice dinner, lovely adda sessions and warm informal environment! What more do you need for a feel good time! I feel rejuvenated! Looking forward to the next season of BCL! “Music doesn’t lie. If there is something to be changed in this world, then it can only happen through music. Music is universal. Music is the healer. Music is the strongest form of magic! And yesterday, it was an evening dedicated to music. I feel so proud to think that the music in Bengal has a glorified history and from Jaydeb’s Charyapad to Bangla rock…we have come a long way. Bangla music has touched most of the genre of music. Yesterday evening was special because the renowned artists from both the Bengal performed for a single event. Just like ‘Shankhachil’ music knows no bound. And we succeeded to come closer and unite to represent Bengali music. Arman Fakir, Gulam Fakir and their team set the mood right at the beginning with their soulful take on Bengali folklore. What would be a better way to start the program with Lalon’s songs that talk about a world without any boundary, any discrimination of cast, creed and religion! 8th March has been declared as the International Women’s Day by United Nations General Assembly for a reason; to appreciate the contributions of women in society. An awareness to spread over the world that a country, a society, a neighborhood, a family cannot be completed without women. It is disheartening to see the news of female infanticide, domestic violence, rapes, molestation everyday where women are constantly appearing as victorious individuals. But also there are so many instances where women fought like a true warrior and inspired a whole nation. They are the shining beacons of hope. This blog is dedicated to all those powerful women who won in their respective fields like a boss and made our country proud! Some of them are Indian, some are not. But they all have a deep root in this country. “Love cannot remain by itself — it has no meaning. Love has to be put into action, and that action is service .” – Mother Teresa, the epitome of kindness spent her whole life serving the people of a different country. And without a great sense of humanism it is not possible for an individual to serve so many people just for the sake of it. The traumatic experiences like Bengal Famine or Hindu-Muslim riot in 1946 affected he so much that she plunged herself more into helping others. Such was her power of love. “From a creative point of view, there’s nothing so dangerous as security.” While going through Jhumpa Lahiri’s autobiography, this line stunned me. This can’t be more apt! This Indian- American author had a deep root to India which is very evident from her creations. The characters of her novels are most of the time torn between cultural values of their own homeland (India) and their adopted home (America). And there came a girl who touched the sky. Literally! Yes, I’m talking about the first Indian woman to go to space, Kalpana Chawla. Growing up in a male dominant society couldn’t stop her from spreading her wings to fly higher. Her death was unfortunate but she left a mark deep enough to inspire millions to chase their dreams. History witnessed women with exceptional bravery fought for their country. And the first name comes to my mind is Rani Laxmibai, the icon of the Indian Nationalist Movement. She will always remain a role model of utmost courage and bravery. The fire in her eyes and sword in her hands, the aura she carried is inspiring for generations after generations. There are plenty of examples how women fought and won their battles in different countries, different situations. These are just a few names. Besides those, there are women who are the winners in their daily lives. Arundhati Bhattacharya, the first woman chairperson of SBI, Kiran Bedi, the first woman IPS officer, Neerja Bhanot who sacrificed her life for the save the passengers on board, Asha Roy, the fastest Indian on the track. Can we name a single field where women are standing behind? NO! They all deserve a standing ovation!